Some of the better known photographers for the Union were Louis Landry, Brady's personal assistant, T.C. 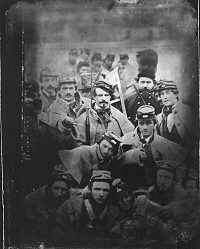 Roche, Alexander Gardner, Timothy O'Sullivan and George Barnard but there were many others.The Confederacy had many photographers including George S. Cook. (who was once Brady's studio manager). 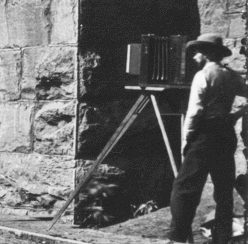 Brady took many photos too, often under highly dangerous conditions, the clumsy camera and photo wagon was an attractive target for a sniper. Exposure times were long, from four to forty seconds. Brady's advanced photo darkrooms in his studio were highly adapt at making a copy negative, in pencil retouching of defects, and thus he was well equipped to make copies of other works for his collection, even if he lacked the original negative. The Brady studios were fully equipped to make copies of interesting images photographed by other photographers.